Unemployment refers to the state of not having a job, or being unable to gain employment when seeking work. In the United States, the number of unemployed individuals is used to evaluate the health of the economy. The unemployment rate used in such evaluation relies on the number of unemployed people, as well as the number of people available to the workforce. 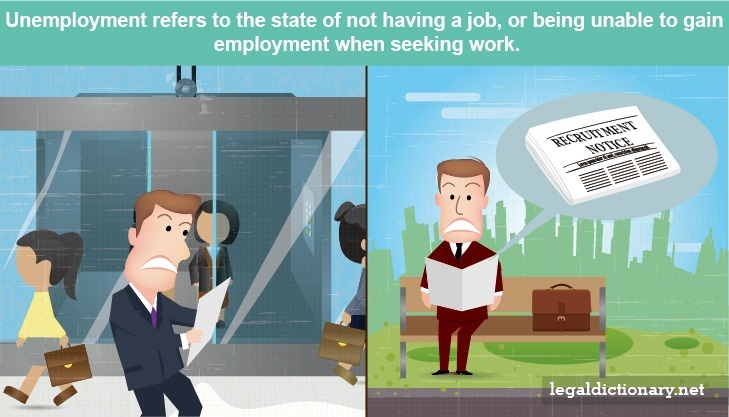 To explore this concept, consider the following unemployment definition. The term unemployment usually refers to the state of not having a job, when the individual is actively seeking employment. The number of people in any geographical area who are unemployed is considered the most important economic statistic, and measure of the strength of the area’s economy. To determine the unemployment rate in any given area, the number of people who have been without work for at least four weeks, and who are actively seeking work, is divided by the total number of people working or available for work. This workforce estimate includes all people who want to work, while excluding retired and disabled persons. In Littletown, Ohio, there are 43,000 people who are employed, and 8,000 people who have lost their jobs, and are seeking employment. Using the above formula, there are a total of 51,000 in the workforce, when divided by the number of unemployed people (8,000), the unemployment rate of Littletown is 6.4 percent. The available history of unemployment is limited, as there has not always been a system in place to measure unemployment rates. As the world became more industrialized, the notion of tracking employment statistics became more common. In the late 18th century, unemployment and poverty became major issues in Europe, finally gaining the attention of the governments. By the 19th century, unemployment in Europe had all but disappeared. This was due to the scarcity of laborers and skilled tradesmen in America. World War I created jobs for which there weren’t enough workers, dropping unemployment rates in the U.S. Large companies, such as Ford Motor Company, increased wages in an attempt to keep their workers. Following the end of the war, however, unemployment began to rise, and the Great Depression saw a steep unemployment rate in the United States of 25%. Unemployment insurance is a program intended to provide workers with payments while they are involuntarily unemployed. Unemployment insurance benefits are administered by each state, though the programs must meet certain criteria established by federal law. Unemployment benefits programs are funded by payroll taxes contributed by both employees and their employers. In order for an unemployed worker to receive benefits, he must meet certain eligibility requirements, including the loss of his job under conditions that are not his fault. The amount of unemployment benefits paid to any worker depends on the state in which he was employed, and his salary level during a specified period of time prior to the loss of his job. Barbara is laid off from her job as a sales associate at a large corporation. After looking for work for two weeks, she files an unemployment claim in her state so that she can receive compensation as her job search continues. When her claim is approved, Barbara receives 40% of her previous salary for a specified number of weeks, or until she obtains employment. Each state maintains a division of labor at which out of work individuals can file for unemployment. The U.S. Department of Labor provides a locator service to aid people in finding their state’s unemployment office. When a person wonders how to file for unemployment, he should contact his local unemployment office. Many states allow people to file their initial claims for unemployment online. These websites also make it easy for those people to make their weekly reports, and check the status of their claims for benefits. For people who don’t have internet access, unemployment claims can be filed by completing a printed application, and delivering it to the unemployment office in person, or by mail. After an individual applies for unemployment benefits, an approval process begins, in which the unemployment division checks the information provided, and verifies payroll information for the required work period. Once approved, there is a one-week waiting period, which is not reimbursed. Because of this, it may take two to four weeks for payments to begin. When filing an unemployment claim, the unemployed person must provide certain specific information as required by his state. In addition to identifying information, such as name, date of birth, and social security number, he will be asked questions regarding his employment. Every unemployment claim requires the person to answer questions about the circumstances surrounding the loss of his job. After filing the initial unemployment claim, the person must file a claim for each week he receives benefits. Failing to do so can result in his claim being closed. Unemployment benefit payments may be received in a variety of ways. Most states issue debit cards to which the worker’s weekly benefit payments are directly deposited. Some states still offer direct deposit into a bank account, and a few issue checks. Unemployment benefit payments are made weekly or bi-weekly, depending on the state. Unemployment fraud is a serious criminal act that occurs when a person knowingly lies or uses deceit to collect unemployment benefits. Classified as a white-collar crime, unemployment fraud may involve both employers and employees. When a person is found to have intentionally lied or misrepresented the facts on an unemployment claim, or on continuing claim forms, he may be prosecuted for the criminal offense of fraud. Unemployment fraud can result in legal penalties including fines, restitution, prison time, and loss of future benefits. The exact penalties vary depending on the situation and the amount of benefits collected illegally. In 1984, Paula Hobbie, who had worked for two and a half years as an assistant manager of a jewelry store, informed her supervisor of her impending baptism into the Seventh-Day Adventist Church. Due to her new religious convictions, Hobbie told her supervisor that she would no longer be able to work on the Sabbath, which begins on Friday evening, and ends on Saturday evening. The supervisor agreed, and Hobbie’s schedule was modified, with her agreement to work evenings on other days, and on Sunday. When the company’s general manager learned about the new schedule, he told Hobbie that she would either have to work her scheduled shifts (including the Sabbath), or quit. Hobbie felt she had no choice, and resigned. When she filed for unemployment benefits, Hobbie was denied on the basis that, according to the company’s manager, she had been fired for “misconduct.” Hobbie appealed the decision to the Florida Unemployment Appeals Commission, and to the Florida Fifth District appellate court. Both of these tribunals upheld the previous decision.